A ‘new’ crochet trend is making its way around the internet this week. The concept has been around for a while but really took off this week. A standard beanie with a hole at the top to allow for a ponytail or a bun to peak through. I have made two different types. One option uses bulky yarn (5 ply), the second option uses standard red heart super saver (4 ply). Both patterns below are for a standard adult hat approx 20in circumference. I hope you find the patterns helpful! Please leave a comment if you have any questions! Thanks! Row 1 Start with a standing double crochet around the ponytail holder. DC 22 around and join with a slip stitch. Row 2 Chain 2, DC in the same stitch. DC in next stitch, 2 DC in the next stitch. Follow DC, 2DC pattern around, and join with a slip stitch. Row 3 Chain 2, DC in the same stitch. DC in next 2 stitch, 2 DC in the next stitch. Follow DC 2, 2DC pattern around, and join with a slip stitch. Row 4 Chain 2, DC in the same stitch. DC in next 3stitch, 2 DC in the next stitch. Follow DC 3, 2DC pattern around, and join with a slip stitch. Row 5-8- Chain 2, DC in the same stitch. DC around, and join with a slip stitch. Row 9- Slip stitch around and finish off. DC 33 around and join with a slip stitch. Row 3 Chain 2, DC in the same stitch. DC in next 10 stitch, 2 DC in the next stitch. Follow DC 10, 2DC pattern around, and join with a slip stitch. Row 4 Chain 2, DC in the same stitch. DC in next 11 stitch, 2 DC in the next stitch. Follow DC 11, 2DC pattern around, and join with a slip stitch. Row 5 Chain 2, DC in the same stitch. DC in next 12 stitch, 2 DC in the next stitch. Follow DC 12, 2DC pattern around, and join with a slip stitch. Row 6 Chain 2, DC in the same stitch. DC in next 13 stitch, 2 DC in the next stitch. Follow DC 13, 2DC pattern around, and join with a slip stitch. Row 7 Chain 2, DC in the same stitch. DC in next 14 stitch, 2 DC in the next stitch. Follow DC 14, 2DC pattern around, and join with a slip stitch. Row 8 Chain 2, DC in the same stitch. DC in next 15 stitch, 2 DC in the next stitch. Follow DC 15, 2DC pattern around, and join with a slip stitch. Row 9-11 Chain 2, DC in the same stitch. DC around, and join with a slip stitch. Row 12-15 Chain 2. FPDC around DC from previous row. BPDC around DC from previous row. Continue around, and join with a slip stitch. At the end of Row 15 finish off. Fall is coming and with it are the seasonal craft fairs! My first fair of the season will be at Newark Community Day on 9/18. It takes place on the Green from 11am-4pm. I hope to see you there. I plan to have my Halloween Buddies, and some beard face warmers available, as well as the usual favorite little unicorns, and turtles. What craft fairs do you attend? What type of items do you tend to look for? Gifts? Home decor? Many changes are ahead for Mama Moseley Creations. This summer my family is moving! In a situation that was presented to us totally by God working we are currently packing up and attempting to sell our home. This means currently Mama Moseley Creations is not take on new orders. I will continue to share new patterns, and upcoming events. I am planning to start taking orders again on 9/1. Some additional changes that are taking place are through facebook. They are changing their newsfeed again which is impacting who sees what business’ post. If you’d like to stay up to date with my items, patterns and such. Please follow me here on my blog. Also I can be found on etsy and on Instagram. As always please feel free to share your ideas and custom requests! I am working on a year long project for myself. This is a temperature blanket. Temperature blankets typically use a rainbow of colors for the range of temperatures. Normally red for hotter days and blue for colder days and other colors in between. Each day you typically add a row based on the day’s temp. I am personalizing my blanket by using natural tones and information from 2014 (our 10 year wedding anniversary). Also I am having 56 stitches represent a day. Each week will cover 4 rows. By using a past year I have all the information I need and can work on a the blanket a few days at a time at my leisure. If this blanket works out well I may make one for each of the kids using their birth years for reference and letting them pick the colors. Are you planning any long term projects? Photos show my color choices and progress up to day 60. I will try to post pictures each 50 days of progress. Bouncing into the New Year! 2015 brought many new experiences, and challenges. I am amazed at how my business has grown and changed over the past year. Through custom orders I had the chance to learn new techniques and fine tune some common stitches. I have gained confidence both as a business owner and a crochet artist. Instead of sticking to patterns created from others, I have branched out to changing patterns to meet my needs, combining ideas of two patterns to create a brand new one, and actually writing my own patterns! As 2015 comes to a close I am thankful for all of the ways I have been blessed. 2016 is sure to have its own excitement and new experiences. I am hopeful to take some of what I learned this year and apply it to the future. I am hoping to blog on a consistent basis about a variety of topics. I am also hoping to boost my ready to ship stock, and continue to branch out through community events. If you would like to donate yarn for the project please purchase Red Heart Brand (super saver, with love, soft are different styles). This brand is available at Jo Anns, A. C Moore, and Walmart. The Heart Association has specified that certain yarn is to be used for the project. I would also appreciate hats that you have knit or crocheted as well. Please refer to the website above for patterns. If there is interest we could even have a crochet/knitting night at my home or elsewhere to work on a group of hats! Let me know if you are interested! I LOVE Charisma yarn from Michael’s Craft Stores! Recently it was on sale for much less than the regular price of almost $5/ skein. I bought up a bunch of colors. I was so excited! When I brought the yarn home I wasn’t sure how I was going to use it. I had picked variegated colors and needed to find a pattern that really showed off all of the pretty colors. I started a simple v stitch scarf. This worked but make the colors into a block pattern. It was starting to look like a striped scarf and the colors didn’t change at a consistent rate. I wasn’t happy. So I tried something a little different. I love the way this pattern worked out. The colors really showed well. This pattern is very simple but the yarn really makes it special. I have tried the same pattern with Serenity yarn from JoAnns with similar results. Chain 160 (88 inches) or a length you prefer for an infinity scarf. Slip stitch together. Row 1: Chain 1. Single Crochet around. Slip stitch together. Row 2: Chain 3. Double Crochet around. Slip stitch together. I am so happy to share a FREE PATTERN with you! 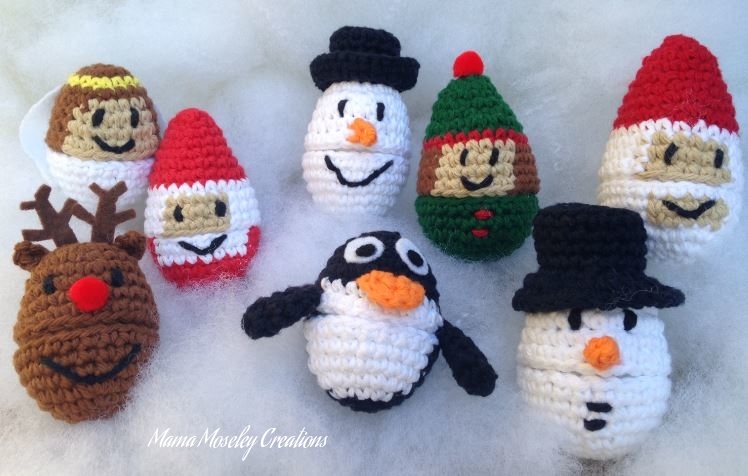 The Egg Buddies are crochet around plastic eggs. This allows you to hide treats or little presents inside of them! I really enjoy designing new characters for this line. 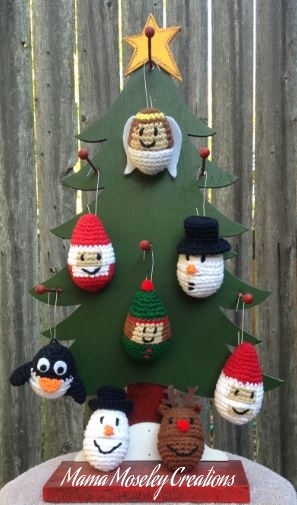 I have finished designing the Christmas Egg Buddies and want to share one of them with you. The additional designs can be purchased on my etsy site individually or as a set. 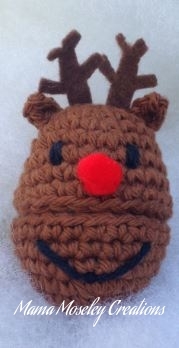 The reindeer is included in the set as well (so you can keep all the patterns together). As always feel free to share your pictures and contact me with any questions. What other characters would you like me to design? Fasten off but leave a long tail. The tail will be used to stitch the bottom and top of the egg together. The tail will be used to stitch the bottom and the top of the egg together. Attach the bottom to the top across 6 stitches to create a good connection. With brown felt cut out two antlers and glue to top piece between the ears. Put a little hot glue on the bottom half of the plastic egg and press firmly into the bottom of the body. Also secure the edge of the bottom piece with glue. Do the same with the top half of the plastic egg. The egg should be able to open and close with a little squeeze. This pattern is copyrighted by Amy Moseley (2015). Any reproduction and/or distribution of this pattern in any way is strictly prohibited. You may print a copy for yourself. Please refer others to one of my site for their own. Commercial use of this pattern is prohibited. Small Scale sales (such as local boutiques or swaps) are ok as long as the product is made by you. Finished products may also be sold in your own online shop as long as it was made by hand, by you. No other resale is permitted. Although not required, reference to me and/or my shop in your listings is appreciated.